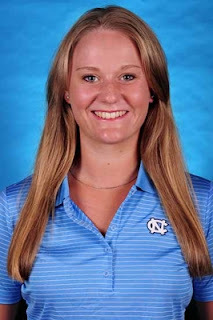 English students Elizabeth Mallett (North Carolina), Alison Knowles (Michigan State) and Elizabeth Prior (UNLV) are unlikely to advance from the NCAA Stanford Regional even though they are playing pretty well - so high is the standard at this level of US college golf. With one round to play, Mallett, pictured, is T14 on 145 with rounds of 75 and 70, a very good second round! Knowles (76-72) and Prior (73-75) are joint 30th on 148. The field is 96 strong. 569 Stanford (playing over their home course in California), 571 Southern California and 584 Ohio State.